"Gobi picked me to be her pal for life." You never know when a sweet stray dog will come along and decide to make you her human. For extreme marathon runner Dion Leonard, it was about 20 miles in to an arduous 155-mile, cross country race. It all began during this summer's 4 Deserts Gobi March 2016, a 6-day foot race weaving through China's largest desert. Leonard was one of 101 human participants - but he soon found himself joined by a different sort of competitor. A little homeless dog living near where the race commenced the first day had decided to get in on the action, trotting alongside the other runners for the first 22-mile stretch. Leonard had noticed the pup back at the runners' camp, though he could never have guessed she'd be in it for the long haul. And, as it turns out, she was looking for a racing partner. "On Day 2, I was at the start line for the race stage and she was standing next to me looking up at me," Leonard told The Dodo. "I thought to myself this little dog isn't going to last very long at my side as we raced off, but she ended up running the whole day and 23 miles distance." 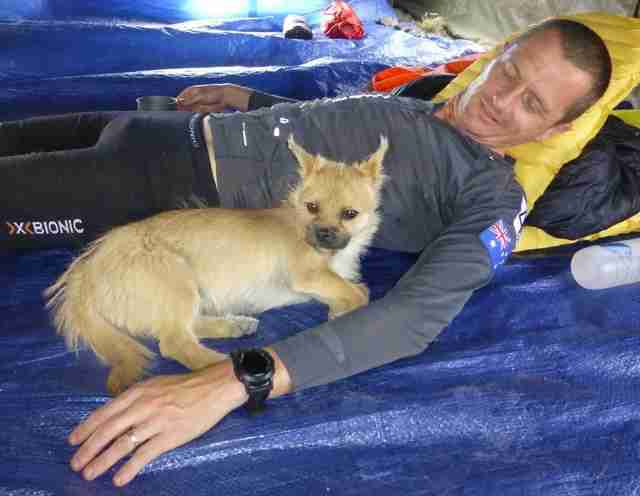 After crossing the finishing line and settling in at camp, the dog still refused to leave Leonard's side. From then on, they were inseparable, and Leonard decided to name his new companion Gobi. Day 3 was no different. Again, with Leonard by her side, the formerly unloved dog ran along for that 26-mile stretch. "For a little dog Gobi certainly has a big heart and some pace to match," said Leonard. Gobi had to sit out for Day 4 and 5 because the weather was deemed too extreme to let her participate. Instead, she was given a lift to the ending point by race organizers so that she'd be there to greet Leonard as he came in. On the sixth and final day, however, she was back in the race - running along with Leonard until they crossed the finish line as a team. 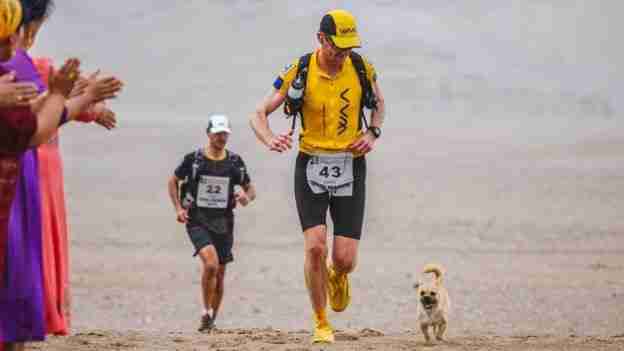 All told, Gobi ran more than half of the 155-mile race - no small feat for a pup. But Leonard hopes their journey together can go on even longer. He wants to take her home to Scotland and be his pet. 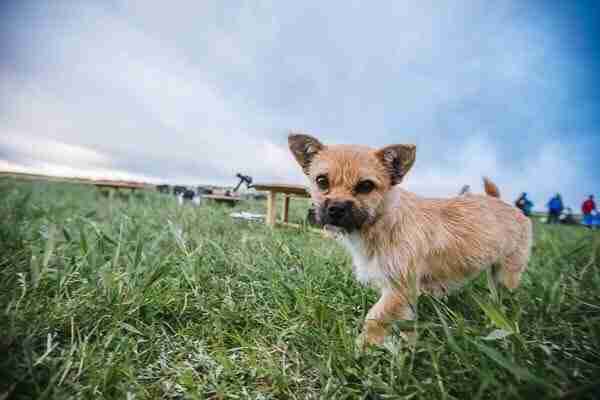 Legally, getting a dog cleared for entrance into the U.K. is a long and expensive procedure, requiring a medical check and a 4-month quarantine, but Leonard is committed to making it work. He left Gobi with a trusted friend in China and has started the process so they can ultimately be reunited. So far, hundreds of donors have already pitched in help cover the costs. "Gobi picked me to be her pal for life, so I am doing what I can with some great support from around the word to make this happen." 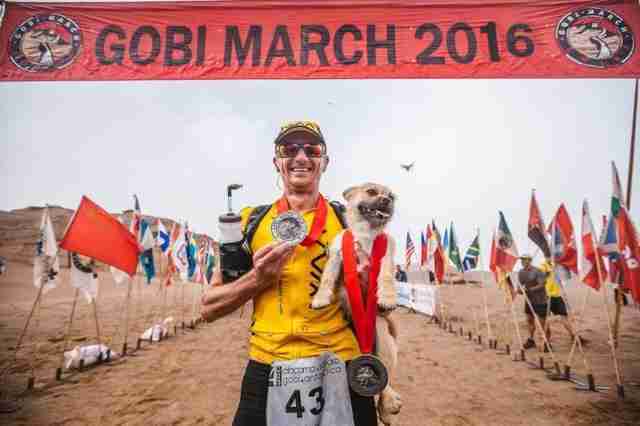 Click here to support Leonard's efforts to bring Gobi back home.